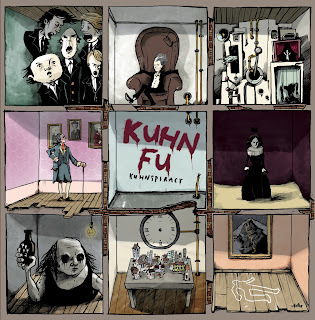 KUHN FU's newest release is the jazz/prog/rock/freak-out KUHNSPIRACY, 8 tracks of varying degrees of instrumental lunacy. The group is a four piece from various nations but came together in Groningen, Netherlands. The group is divided up this way: Composer/guitarist Christian Kuhn is from Germany, the bass clarinetist Ziv Taubenfeld is from Israel with Serbian drummer Lav Kovac and Turkish bassist Esat Ekincioglu rounding out the rhythm section. Multi-national and multi-cultural but together they strive to create some oddly engaging sounds, good music knows no borders. The art work leads you to believe things are gong to get eerie and that is the truth. The songs can change on a dime, from light and airy to dark and demented metal clangs, "Barry Lyndon" is a good example of this as you have no idea which way the song will be turning stanza to stanza. After a spoken word intro, the haunted house feeling of "Signore Django Cavolo" leaks out while closer also gets some vocal codes as "Eiger-Norwand" is an ode to the ill fated mountain climber Hans Schmidt. A more nuanced and complete flowing track is that titled "Deus Ex Machina" which progress up and down the scales but with an execution and tempo that is thrilling yet controlled in the right way. Another winning effort is "Mono Industrial Post Depression" that is groovy and attacking in the right parts making for quite the journey. "Maharani" is a slow paced journey that gets a mid-song jolt of chaos while "Pelto Pekka is lead by the percussion and rhythmic beats. The opening track "Taubenfeld" is reminiscent of Les Claypool's recent lighter solo work as it lumbers to and fro with eccentric changes and spacey oddness. You can never get comfortable with any of the tracks and that is a good thing as this style of music is made to be radical and shifting under your feet. 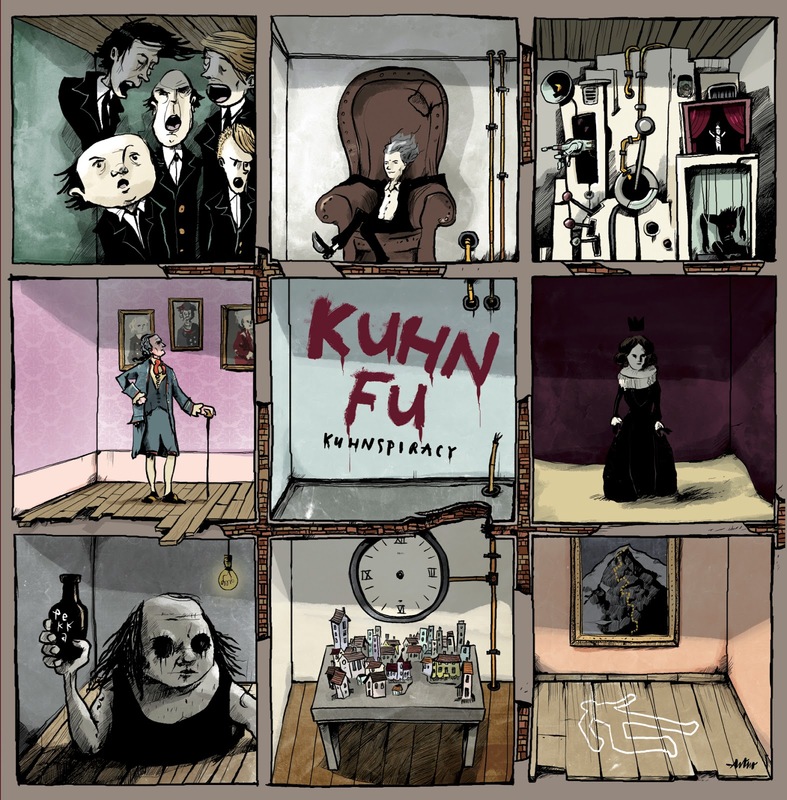 KUHNSPIRACY is not for the faint of heart, but adventurous music lovers may just get the right kick from their craziness.